LOW MILES - 9,644! PRICE DROP FROM $24,000. Back-Up Camera, Turbo Charged Engine, Onboard Communications System, Satellite Radio, ENGINE, 3.6L V6, DI, VVT, AUDIO SYSTEM, CHEVROLET MYLINK RADIO. Aluminum Wheels. VVT (335 hp [250 kW] @ 6800 rpm, 284 lb-ft of torque [383.4 N-m] @ 5300 rpm), TRANSMISSION, 6-SPEED MANUAL, CHEVROLET MYLINK RADIO WITH 7 DIAGONAL COLOR TOUCH-SCREEN, AM/FM STEREO WITH SEEK-AND-SCAN AND DIGITAL CLOCK includes Bluetooth streaming audio for music and select phones; featuring Android Auto and Apple CarPlay capability for compatible phone (STD). 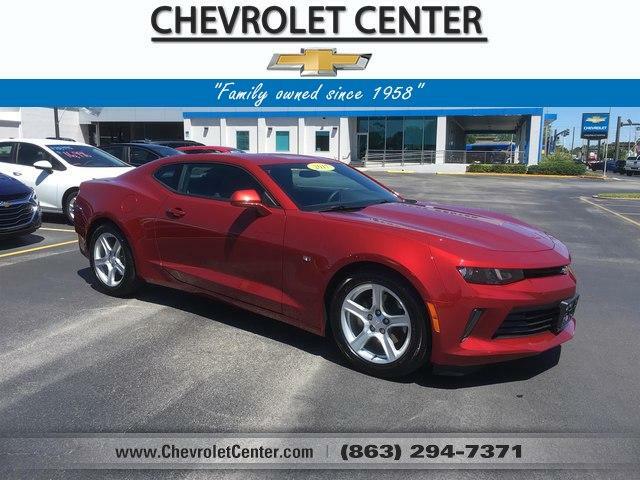 Edmunds.com's review says Compare the 2017 Chevrolet Camaro to pretty much any of its competitors and you're likely to come away with the impression that it's fast. Its high-horsepower output and light curb weight makes a big difference on the road. Stomp the gas and you'll need little time to overtake the competition..